We’d love your help. Let us know what’s wrong with this preview of Home by Amanda Berriman. Meet Jesika, aged four and a half. The most extraordinary narrator of 2018. To ask other readers questions about Home, please sign up. Jesika is four and a half. She lives in a flat with her mother and and baby brother and she knows a lot. She knows her flat is high up and the stairs are smelly. She knows not to draw on the wallpaper or touch the broken window. She does not know that their landlord is going to evict them and that Toby's cough is going to get much worse. Or that her best friend, Paige, has a secret that will explode their world! This story is told by a confused and vunerable child. By the time you realise what th Jesika is four and a half. She lives in a flat with her mother and and baby brother and she knows a lot. She knows her flat is high up and the stairs are smelly. She knows not to draw on the wallpaper or touch the broken window. She does not know that their landlord is going to evict them and that Toby's cough is going to get much worse. Or that her best friend, Paige, has a secret that will explode their world! This story is told by a confused and vunerable child. By the time you realise what this story is about, you are half way through the book and there is no way you will put the book down as you will be totally hooked. Don't get me wrong, this is a difficult story to read. This book will mess with your emotions. This is a book that you will be thinking about for a long time after you finish it. I decided to read this as it was recommended to me, and what a read it turned out to be. I found it almost impossible to put down. The whole of Home is narrated by a four and a half year old character called Jesika. At first I found it so cute to read. The way Jesika spoke and her view of what’s going on around her was endearing. However, that amusement quickly wore off for me, as I started to imagine the life of poverty she was facing, living in poor conditions and struggling to eat enough food. I decided to read this as it was recommended to me, and what a read it turned out to be. I found it almost impossible to put down. The whole of Home is narrated by a four and a half year old character called Jesika. At first I found it so cute to read. The way Jesika spoke and her view of what’s going on around her was endearing. However, that amusement quickly wore off for me, as I started to imagine the life of poverty she was facing, living in poor conditions and struggling to eat enough food. I found myself gradually settling into the book, and although feeling sad about the life Jesika was living, she knew no different, so it was fascinating seeing her mostly positive experience of life through her thoughts and feelings. This story does delve into darker matters, and I have to be honest, I did find it rather hard reading some parts of it. I felt sick to my stomach at times. This is a wonderfully written book and Jesika has become one of my all-time favourite characters, but as this story does cover the subject of child abuse, some readers may find parts of this book quite distressing and emotional. I have mixed emotions warning others about this, because if I knew that topic was included in part of the story, I almost definitely wouldn’t have picked it up, which means part of me wouldn’t have had to experience those yucky feelings inside me, but at the same time I would never have met the wonderful Jesika, and that would be a shame. Sometimes you read a book and you dread having to write your review as you know that whatever you try to say, you are never going to be able to convey exactly how much the book affected you. This is one of those books. When I finished it I knew that I had just read possibly the best book of 2018 and probably one of my most favourite books of all time. It’s one I can’t even bring myself to put on my bookshelf yet as I’m not quite ready to let go of Jesika just yet. This beautifully written, deepl Sometimes you read a book and you dread having to write your review as you know that whatever you try to say, you are never going to be able to convey exactly how much the book affected you. This is one of those books. When I finished it I knew that I had just read possibly the best book of 2018 and probably one of my most favourite books of all time. It’s one I can’t even bring myself to put on my bookshelf yet as I’m not quite ready to let go of Jesika just yet. This beautifully written, deeply affecting tale of poverty, abuse and a child’s love for her family and friends is a socially relevant and heartbreakingly believable tale of our time and I embraced every single page. Amanda Berriman has cleverly used the voice of a 4 year old girl here and the narrative flows far more smoothly than I would have expected. I know that there have been comparisons to Room and there is the similarity between them so far as they both use the inexperienced voices of children who see an innocence in situations that we know are far from harmless. I should probably say now that there are some very tough to read scenes here. But by using Jesika’s perspective to communicate them, I felt I HAD to read every word because if I had flicked my eyes over the words that would normally have been impossible for me to identify with, then I would have felt like I was abandoning Jesika. I needed to stay with her and keep her safe. And that’s how I felt about Tina and Toby as well! I just wanted to move them all into my spare bedrooms and take care of them! I am absolutely amazed that this is a debut novel! I was so incredibly moved by the story that is unravelled through the eyes of this most extraordinary little girl. Amanda Berriman has skilfully written a stunning novel that should be read by everyone who comes into contact with children as it’s all too easy to forget that they see our world with a naivety that is all too easily taken advantage of. I loved the way current guidelines were used to explain certain things to Jesika but also felt very sad that nowadays we have to teach even very young children about the dangers that could affect them. I have always worried about scaring children and wanting to protect their innocence but by trying to protect them from seeing the scary reality of our society, we could actually be causing more harm than good as nowadays they need to be more aware than ever before. So hard as it was to read, it was reassuring to have that message underlined by the author, who obviously understands children and the difficulties they face in today’s world. I have never felt such love for a character before but Jesika stole my heart from the very first page and owned it till the very last whilst breaking it into a hundred million devastated pieces along the way. I laughed along with her but mostly I cried. That’s not an indication of this books being overly sad but just that I found myself totally overcome with emotion at her situation and the difficulties that she faced alongside her family. But it was also an uplifting book, full of hope in a world where there is often very little. With it’s supporting cast of memorable characters Home is a book that I won’t be able to forget in a hurry. And I know that I haven’t been able to do it justice in my review but I will try to remedy that by recommending to absolutely everyone I know! Trust me, you NEED to read this book! Told solely through the eyes of Jesika (4.5 years old) we learn all about what home is to her. It is a single mother, a father who lives in Poland, and a toddler brother. It is a home where she has never been to a cafe, hardly ever eats chips, where the windows can't be opened, the front door is broken, the hot water is often not on and the mean "Money Man" is threatening to evict them. It is also a home with a mother who loves her unconditionally and where she feels safe. Then mum gets some new Told solely through the eyes of Jesika (4.5 years old) we learn all about what home is to her. It is a single mother, a father who lives in Poland, and a toddler brother. It is a home where she has never been to a cafe, hardly ever eats chips, where the windows can't be opened, the front door is broken, the hot water is often not on and the mean "Money Man" is threatening to evict them. It is also a home with a mother who loves her unconditionally and where she feels safe. Then mum gets some new friends and one of them Jesika really doesn't like. I find it hard to read books told through a small child's voice as it can get a bit repetitive (and frustrating!). But I think the author did well at maintaining her unique voice and telling a story which was, at times, quite adult. The novel is also a reminder to parents to be vigilant and listen to your children. It can be SO difficult sometimes to break through the noise and the (quite often) untruths that they tell at that age so a safe home and taking some time to have a focused conversation is really important. It certainly was a bit of a wake up call for me, as I could see myself in Tina so often with the frustrations of just getting kids out the door and dressed etc.! I recommend this to those who like character driven novels and are prepared to feel a little uncomfortable. In ‘Home’ Amanda Berriman manages to combine several things I have only the most tenuous tolerance for in literature and do it in such a way as to make me absolutely love the result. I generally dislike present tense narrative but I was halfway through the book before I even noticed it was in present tense – always a sign that the author is in full control and you as a reader are safe in her hands. I'm also not very fond of inadequate narrators. I don’t mean unreliable narrators - I love an unreliable narrator. Inadequate and Unreliable narrators are both tricky to pull off realistically, although in my opinion managing the former requires feats of creative skill rarely possessed by those who attempt it. Both conceal things from the reader but an unreliable narrator intends to do this since they have an agenda of their own or a mindset that will not allow them to communicate the story more accurately. An inadequate narrator communicates faithfully but at the level at which they themselves understand the events - think Room by Emma Donahugh or The Curious Incident of the Dog in the Night Time by Mark Haddon. In fact while I acknowledge that those two examples are excellent books, where inadequate narration is done well even, I hated both of them intensely. Not so with ‘Home’ which is narrated by four year old Jesika. It takes a bit of an adjustment to get used to four year old speak but it is so authentic and emotionally honest you get drawn in before you even realise it. I honestly haven’t enjoyed an inadequate narrator so much since I reread ‘To Kill a Mockingbird’. I loved ‘Home’ and I fell in love with Jesika. Like the aforementioned books, ‘Home’ uses a child’s point of view to explore some very difficult issues. It’s a mark of Berriman’s skill that we are kept close enough to care deeply about the events as they unfold but we are in many respects protected by Jesika’s lack of full understanding. I think this is the mark of a truly great inadequate narrator. An adult narrator is unlikely to have as much power to make us consider the issues presented, and challenge our preconceptions, as a bright and engaging four year old, whose imperfect understanding and unoccluded vision take complex problems and make them simple enough for us to really focus on. We lose so much of the simplicity and sense of justice innate in children as we grow up – and we should in many ways because we have to function as adults – but the privilege of seeing the world through Jesika’s eyes makes you ask yourself whether you haven’t really lost something you should have tried to hold on to. Couldn’t we add things as we become adults rather than just subsume our child selves? But I digress. One of the strongest points in the novels favour was the pitch perfect portrayal of what it’s like to be a four year old. Home will make you feel things, people. I don’t necessarily even mean bad things - although let’s face it, much of Jesika’s reality is a grim one. Reading the book, I found myself remembering things I thought and felt at that age that I hadn’t thought of for years; remembering, in short, what it was like to be utterly reliant on someone else and the terror at the thought of that person going away; remembering the comparative powerlessness of being a child and the inherent sense of injustice that often went with it; remembering how it was to really be in the now almost all the time, because time was way too long and now was full of good things, and how simple things could be the most important things of all. I especially remembered checking the emotional weather forecast in adult faces and acting accordingly as Jesika does, how people shouting could seem to make the world shake. I think we forget these things as we grow up and they become trivial or inconsequential but from a four year old’s POV they are incredibly important. Berriman’s ability to put herself in Jesika’s shoes to tell us this story is breath taking. Another strong point for me was how the story unfolded. There are many ways to tell a tale but there seem to be two main ways of getting your readers to turn the pages – the trick and the art. The ‘trick’ involves forcing your reader to continually ask questions. What happened then? Who killed the victim? etc etc. Most thrillers and crime novels employ this to great effect. The ‘Art’ is when an author leads you using the character as a lure. Instead of asking questions, the reader experiences what the character does as the author forces the character to react to sudden changes of situation. John le Carre uses this method. So does Jane Austen. And so too, does Amanda Berriman in Home, to great effect. It is utterly seamless and makes the book, which in many ways should be a challenging read, completely effortless. An experience, not merely entertainment. Twice I found myself reading an hour longer than I intended! ‘Home’ is unputdownable. Seldom do you come across a debut novel that has such an impact as “Home“. Written entirely from the viewpoint of a tiny, four-year-old girl, the novel touches on issues with important social observations. At first I was taken aback by the way she spoke, but after a few pages I could actually hear her little voice, and the pages flew by. Jesika Petrowski lives is a run-down, derelict apartment building. She lives with her Mummy, Tina, and her baby brother, Toby. Their flat is a damp, squalid plac Seldom do you come across a debut novel that has such an impact as “Home“. Written entirely from the viewpoint of a tiny, four-year-old girl, the novel touches on issues with important social observations. At first I was taken aback by the way she spoke, but after a few pages I could actually hear her little voice, and the pages flew by. Jesika Petrowski lives is a run-down, derelict apartment building. She lives with her Mummy, Tina, and her baby brother, Toby. Their flat is a damp, squalid place with broken windows, mould on the walls, an oven that doesn’t work, and heating that is undependable. In her innocence, Jesika draws pictures on the wall by joining up the dots of mould. Jesika’s mother, Tina Petrowski, is a tragic figure. A young woman with no family support, she is forced to rely on strangers for help. And help she needs. With no financial help from the children’s father (who has returned to their native Poland to live), her despair is palpable. Both she and her baby son, Toby have chest infections and Toby’s condition is worsening on a daily basis. He coughs and coughs until he vomits up his milk. Tiny lives up many flights of stairs and must haul Toby’s ‘buggy’ up and down those stairs every time she goes out. She has to go out a lot as there are no laundry facilities in the building and Jesika attends preschool in the afternoons. Feeling poorly and despondent, her temper is sometimes shorter than it should be. Jesika’s innocent observations make for many bittersweet moments. Her simple joy at being fed jam sandwiches, a kindly grocer who pulls a ‘magic’ strawberry from behind her ear, the beautiful rainbow she finds in an oily puddle during a rainstorm. Sometimes, because Toby is poorly, Jesika’s Mummy cuddles him more that she cuddles Jesika, which makes the little girl jealous and sad. “Mummy only wants to cuddle Toby”. Then, just when you thought circumstances for the little family couldn’t get any worse, baby Toby is rushed by ambulance to the hospital. Whilst there, Tina is also diagnosed with pneumonia and admitted – leaving young Jesika to go into foster care. Jesika’s overwhelming fear of abandonment are understandably escalated by these traumatic events. She waffles between fearing her mother will never come back, to the childish certainty that she WILL come back. The story, told in the innocent and naive voice of Jesika is heart-rending to the adult reader who views it with an all too vivid clarity. The book succeeds on a variety of fronts. It causes the reader to have more empathy for young children, as we quickly forget what it is like to live in the world as a child sees it. It strikes upon many socially relevant issues: poverty, low-income housing, child abuse, etc. Wow, what an emotional, but at times heartwarming, read! Told from the perspective of four year old Jesika, with everything seen through her eyes and conveyed in her lovely and oh-so-innocent voice, (pronunciation mistakes and all! ), you really get a feel for what life in a disadvantaged family must be like for a young girl who doesn't understand how hard things really are for her mum. There were times when I found Home really difficult to read, as often you know what's coming with a sense of building dread. I felt myself wanting to shout through the book at her to warn her. Saying that, nothing in this book is overly dramatic or ridiculous; it's worryingly realistic. You can imagine only too well it happening - things which I won't give away here - and the idea of a family struggling and falling through the cracks when it comes to housing and support is all-too common in today's society. Home for me was a real mix of emotions, but regardless of how I was feeling, I didn't want to stop reading...even though I often did want to stop reading! See, a mix?! It's an absorbing, heartbreaking, and quite original read. It will certainly stay on my mind for a long time. My Review: Home is an extraordinary debut novel and yes there will be comparisons to Emma Donoghue’s Room because the narrator, Jesika is 4 and a half years old, however unlike Room I instantly connected with Jesika and as a parent my motherly instincts went into overdrive. Jesika lives with her mummy, Tina and her baby brother, Toby in a flat full of damp, mould, broken windows, cracks in the bath, unreliable heating and an unscrupulous landlord. Jesika is the most adorable, insightful, excitable My Review: Home is an extraordinary debut novel and yes there will be comparisons to Emma Donoghue’s Room because the narrator, Jesika is 4 and a half years old, however unlike Room I instantly connected with Jesika and as a parent my motherly instincts went into overdrive. Jesika is the most adorable, insightful, excitable, emotional little girl ever. Her innocence and view on the world made my heart break. There were several moments during the book I had to take a deep breath before carrying on because despite her innocence I was able to see what was happening around her and it felt very uncomfortable not being about to stop and help. Home is told through the point of view of four year old Jesika. Jesika lives in a flat with her mum and younger brother Toby. Her mum is struggling to make ends meet and Jesika struggles at times to understand her mum's moods. All she knows is that she loves her mum and doesn't want to live anywhere other than with her. This story really makes you realise how lucky some of us are. We all have constant money worries but for Jesika's mum she really is on the bread line not knowing how she is going Home is told through the point of view of four year old Jesika. Jesika lives in a flat with her mum and younger brother Toby. Her mum is struggling to make ends meet and Jesika struggles at times to understand her mum's moods. All she knows is that she loves her mum and doesn't want to live anywhere other than with her. This story really makes you realise how lucky some of us are. We all have constant money worries but for Jesika's mum she really is on the bread line not knowing how she is going to pay the rent. Their home is hardly liveable with damp causing health issues for herself and Toby. My heart really went out to them all and I wanted to whisk them away from it to somewhere better. Due to the story line I do think some people may find Paige's story especially hard to read. I could see what was coming a mile away and my heart literally broke. To hear things from a child's point of view really hits you hard. The book certainly homes in on issues very much in todays world. From literally the very first page I was hooked. The book is narrated by Jesika, a four year old who lives with her Mummy and little brother Toby after her Father moved to Poland, never to be heard from again. Jesika’s Mum is struggling with life, she doesn’t have enough money and When I read the blurb for Home I knew that I wanted to read it, I then started to hear from others who had read it and they all seemed to love it so I was even more determined to read it. And I’m so pleased that I did. Home by Amanda Berriman is an emotional tale, told by 4-and-a-half-year-old Jesika. The story tells of her life with her mum Tina and her younger brother Toby and going to Pre-school. They live in a dump of a flat, with a broken window and a boiler that keeps breaking down and Tina with little, or no money. And the scary man that comes trying to evict them. They survive with the help of some friends. I was gripped from the very first page. 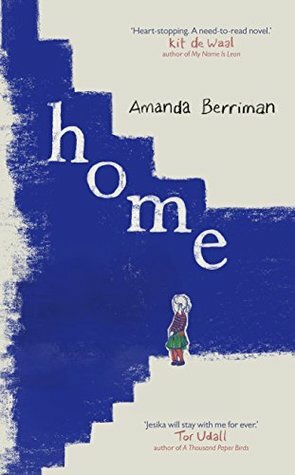 I thought it was expertly written and the author was ver Home by Amanda Berriman is an emotional tale, told by 4-and-a-half-year-old Jesika. The story tells of her life with her mum Tina and her younger brother Toby and going to Pre-school. They live in a dump of a flat, with a broken window and a boiler that keeps breaking down and Tina with little, or no money. And the scary man that comes trying to evict them. They survive with the help of some friends. This story will tug at your heartstrings and will probably be very different from what you usually read. Home is told through a child called Jesika who is four years old, which some readers may find hard to read due to the child’s dialogue but as a mother to a toddler myself I had no problem reading this story. Home will make you open your eyes to a child’s perspective of life and your actions towards them which I am sure we can all learn and relate to especially us parents. I fell in love with l This story will tug at your heartstrings and will probably be very different from what you usually read. Home is told through a child called Jesika who is four years old, which some readers may find hard to read due to the child’s dialogue but as a mother to a toddler myself I had no problem reading this story. Home will make you open your eyes to a child’s perspective of life and your actions towards them which I am sure we can all learn and relate to especially us parents. I fell in love with little Jesika from the beginning. I found Ryan’s character very shifty from the start and then I started to really dislike him. Home is "a safe place, a place where one lives, especially together as a family, it is meant to be a place of affection, joy and happiness, a valued refuge and resting place, a habitation offering security and protection, where friendships flourish." I can only agree, a home is supposed to be all of the above, it's a happy place which is why it's probably so heartbreaking when you see that one or more of these conditions are broken. There's a lot going on in Jesika, Toby and their mum Tina's life Home is "a safe place, a place where one lives, especially together as a family, it is meant to be a place of affection, joy and happiness, a valued refuge and resting place, a habitation offering security and protection, where friendships flourish." I can only agree, a home is supposed to be all of the above, it's a happy place which is why it's probably so heartbreaking when you see that one or more of these conditions are broken. There's a lot going on in Jesika, Toby and their mum Tina's life that is simply not OK, and will make your heart go out to them. Their poor housing conditions are just one of the many struggles. The novel is told through the eyes of a very young child and I was afraid the 'childish language' would turn me off eventually, but it did not irk me and even enabled the author to deliver the story in a much more compelling manner. I'm sure an adult could have told a story about poverty but if a child talks about how she wants to draw a pond around the 'tadpoles' on the wall, and the realisation hits you that she's talking about mold, it just comes down on you ten times so hard and that's what this story is supposed to do. It has to make you 'feel' how hopeless Tina, Jesika's mum, feels at times, caring for two kids on her own, living in what she herself calls a dump, or any other unpleasant name she gives their appartment, and this was further enhanced by Jesika's childishly naive observations, as all she knows is not to draw on the wall or come near the window or she'll be told off. Jesika was a great little protagonist. Above everything else she doesn't want to do anything naughty and risk being sent away where she has to live with a new mummy. It made my heart squeeze how she's trying to make the right choice and do the right thing when push comes to shove about telling on her friend Paige, who sometimes wants to be her friend and other times isn't really friendly at all. I don't want to spoil anything but I do think this novel should come with a trigger warning because it does broach a rather unsettling theme as well. I didn't cry reading this novel and was thankful I was able to keep at least a bit of a distance from the most disturbing events through the narration from another POV which was not as personal as it could have been. I don't know how I would have coped at all if Jesika would have been affected even more than she already was. Jesika is four and a half and lives with her mummy and brother, Toby. They live in a slum flat with mould and broken windows. Jesikas’ mum and brother are taken to the hospital and she is put into foster care. Jesikas’ mum meets an old friend and her daughter and Jesika desperately wants to be Paige’s friend, but Paige is a frightened child who cannot express or tell anyone anything about the horrible games her uncle makes her play. A story of modern-day poverty told Little children have big ears. A story of modern-day poverty told through the words of a four-and-a-half-year-old. I read this book quite quickly and it was well written. The story is a sad one and all too real. However, it is told by Jesika in her child-like language which, although it gives the idea of how a child thinks, 300 odd pages of child-speak irritated the hell out of me and I found myself correcting her out loud!!! Therefore, I read the book so quickly, just to get through the agony. Saying that I also found it hard to empathise with the mum as she was very proud and found it hard to accept the help she was in no position to refuse which could have had disastrous consequences. All in all, I did not enjoy this book very much, but that could just be my view on things, so give it a read and make up your own mind. When I got to 19% through this book, there was a little niggle in the back of my mind. I thought I knew which way this book was going. I have now got to 31% in the book and I'm sorry to say that I'm going to stop reading. It's not just because of the topic either. I was really struggling with reading a book that is from the point of view of a 4 and a half year old. At first, I thought that it would be interesting and a bit of a personal challenge but Jesika just annoyed me. I realise that I'm ve When I got to 19% through this book, there was a little niggle in the back of my mind. I thought I knew which way this book was going. I realise that I'm very much in the minority and that many others have loved the book and the fact that Jesika is so young but this just isn't for me. I say 'stress inducing' for I have NEVER felt such a need to plunge into the pages of a novel and pull out a character, save them from the unfolding plot, wrap them in my arms and keep them safe, warn them... it was hard to bear. Especially as a parent, and because the protagonist was also narrating, a little girl, even younger than that of 'Room'. This might even top Room in my opinion, for its narration - Jack was a precocious 6 year old. Here Jesika is two years younger at 4, and tells us the story of her life in her own words and through her own young eyes. With a single struggling mother, and a sick baby brother, Jesika tries to be a good and helpful girl, doing her best to befriend a new girl at nursery and being friends with the people she meets. She is just so well-conveyed - her understanding of the world so beautifully childlike and naive. The misunderstandings ring true and give her such authenticity that it hurts to see her situation: she watches 'Nina and the New Rons (Neurones)', has to visit the "hopsipal" with her brother. And seeing a horrific situation unfold through Jesika's unknowing eyes is so, so difficult, but so wonderfully well wrought. It feels tense without being tense in the story. As you, the reader find it dawning on you what it going on, the horror of it may bring tears to your eyes as it does to mine. It was so hard to watch a beautiful young girl, her family, her friends, going through this. Jesika may not understand what she can see, but WE can, we want to jump in and help... I'm feeling my body tense again just thinking back to it. Excellent child's point-of-view telling, it must have been very hard to do with such coherence. This subject matter might put some readers off, but actually, it doesn't become graphic, only very uncomfortable and emotionally difficult to think about as a detached observer. Jesika... I haven't forgotten you even a few days after finishing this. I want your brother Toby to be okay. This will hopefully be the next 'Room' though due to the subject matter may not as easily be seen as a successful film. Please consider reading this, you'll not often find a better child narrator. I don't know if I've ever found it harder to write a review. And the reason is because I'm not sure how I can do this book justice. I want to go back to some of the books I've given five stars and take a star away as I will now judge all books against this one. Amanda Berriman has managed something amazing - she has created the voice of a four and a half year old girl, made it credible, made it funny, made it real and made it so that her telling of the story breaks your heart then mends it in so I don't know if I've ever found it harder to write a review. And the reason is because I'm not sure how I can do this book justice. I want to go back to some of the books I've given five stars and take a star away as I will now judge all books against this one. Amanda Berriman has managed something amazing - she has created the voice of a four and a half year old girl, made it credible, made it funny, made it real and made it so that her telling of the story breaks your heart then mends it in so many ways. This is Britain in the underclass where the home you have is a mouldy flat which makes your baby brother cough and the landlord won't fix the broken window. The small community created around the family takes the place of "family" and "society" and Jesika is quite happy. She knows nothing else. When she briefly stays with a foster family or visits her friend Paige, Jesika's amazement at the number of rooms and size of the garden, is quite a lump in the throat moment. Jesika tells the story in beautiful innocence, the smelly stairs to the street, the woman next door with the bad teeth, the women who run her nursery. It is all so well told, but there is a darkness here that Jesika doesn't understand, but we do and that is the reason you can't stop reading. This isn't an "easy" read but it is hugely rewarding and recommended. You will get drawn in by Jesika and then will keep reading because you have to know what happens. This started as a bit of an annoying read, due to the ‘child voice’ narrating it—it wasn’t so easy for me to get into it. Jesika is a difficult narrator to contend with, in that, on top of being unreliable because she sees the world through her own filters, those filters are very much naïve and different from an adult’s. The way she perceives and interprets events wasn’t always easy to follow, and the fact that the words she used weren’t necessarily the right ones didn’t help. However, after the first couple of chapters, I got used to her voice, and I didn’t notice its ‘quirks’ anymore, or at least not in a way that disrupted my reading. Which was, of course, a good thing. Although the novel never veers into sordid (I don’t want to say that Jesika’s narration revealed Paige’s secret in a ‘cute’ way, because it’s not cute, it’s never cute, it’s creepy AF and no child, well actually no one, should ever have to go through that—but it did soften the blows in a certain way), it wasn’t exactly an easy read. Jesika and Paige are both so very young and vulnerable, all the more when one remembers that getting through the regular babble of children at such a young age can be exhausting, and doesn’t leave much room for actually listening, really listening to them when they try to convey something serious. I did enjoy the grown-ups’ reactions around Jesika, though, since they did take things seriously. There was a particular moment, for instance, when Tina could’ve done the coward thing, could’ve chosen to ignore the signals, because acknowledging them sort of put her at risk, too. There are so many stories, so many happening in real life, too, when unfortunately people close their eyes on the obvious and choose the easy way out. At the same time, the circumstances Jesika, her mother and her baby brother have to face aren’t all in shades of black only. There are people around who’re ready to help them, and once Tina manages to get past her pride and accept those outstretched hands, she realises that friendship and trust are things you can find even when everything looks bleak. There could have been darker consequences, and in fact, it’s good there weren’t, considering the story’s themes are already dark enough as it is. Oh Jesika, Jesika, Jesika. How I want to dive into the words and grab you and cuddle and kiss you. I defy anyone not to love this adorable four-and-a-half-year-old little treasure. I couldn’t quite fathom how an adult could get into the mind of a child so young and use her voice to tell her story, but, by golly, she didn’t half do it well. You fall in love with Jesika right from the start: she has you in a vice-like grip from the beginning and within a very short time, you’re thinking, I don’t wa Oh Jesika, Jesika, Jesika. How I want to dive into the words and grab you and cuddle and kiss you. I defy anyone not to love this adorable four-and-a-half-year-old little treasure. I couldn’t quite fathom how an adult could get into the mind of a child so young and use her voice to tell her story, but, by golly, she didn’t half do it well. You fall in love with Jesika right from the start: she has you in a vice-like grip from the beginning and within a very short time, you’re thinking, I don’t want this book to end. Jesika lives with her mummy and baby brother Toby in a hovel of a flat: the epitome of housing rented out by a scumbag. It’s damp, it’s cold, the bath has a crack in it, so you can’t fill it too high and the boiler pilot light keeps going out. But it’s home to Jesika. She loves preschool and very much wants to be friends with Paige. Such poignant innocence and blessed naivete. It’s all very adorable so far. About a third of the way into the story, you suddenly realise there are some red flags…and you hope beyond hope it’s not all going the way you dread. But Jesika has you hopelessly smitten by now. You’re besotted with her, and all the people in her little life, whom she loves. It’s quite an exhausting read: Jesika doesn’t speak in commas and full stops. Four-and-a-half-year-olds don't. She can speak for quite a long time without drawing breath. But don't let this fool you into thinking that the novel isn't an adult one. It is. "Home" is Amanda Berriman's debut novel and I knew I want to read it as soon as I've received an email from NetGalley with a short extract from it. It is not the easiest book - storyline - wise - but it is also a read that will have you gripped and that won't let you go. "Home" was not the easiest read. It made my stomach turn and I wanted to slap one of the characters with my bare hands. It was heart - breaking, probably because it was so close to reality, and I think the fact that the author handed over the narration in the little Jesika's hands made it even more harder and it totally mess with our emotions. Jesika, as a narrator, works brilliantly. She's not too mature even though she knows a lot - she's just a very sensible, vulnerable child that experiences things that she shouldn't experience. Seeing world through her eyes is authentic and genuine and honest and you are immediately drawn in - we see things through the four - year - old girl's perspective and those things are perfectly portrayed. We can totally relate to what it is to be a four - year - old and how it is to be a child in this grim reality where the adults not always take you seriously, how it is to be powerless, how hard it is to attract adult's attention to what is really important. The way Amanda Berriman got into Jesika's head and told us this story is actually breath - taking. However, I am in minority here with my opinion, I know, and while I absolutely, totally appreciate what the author has tried to achieve with her story, it just didn't work for me on all the levels. I am not sure what Amanda Berriman wanted to tell us here and on what should I focus. The two main storyline, the one about Jesika and her family and then Jesika and her friend Paige felt for me under - developed. They were started off but the execution has felt for me here. The subplot with Paige annoyed me incredibly, I just couldn't believe that her mother didn't see the obvious. There were parts in this story that I reckon were not necessary, like Jesika spending time at the foster family - I just think this book could do without it. But even though it was a hard book to read because of the topics it touches upon, a sense of building dread because you know what's coming, it was easy to read. The writing style is seamless and it effortlessly transports us to Jesika's world and it is very realistic. It is not overdone, actually it is worryingly close to life and you easily imagine all the things happening. However, it is not only doom and gloom, as there are some uplifting things in the story as well - the power of friendship, of finding allies when you're not expecting it at all. Altogether, "Home" was absorbing, gripping and heart - breaking read with realistic characters that you quickly fell for and with very realistic topics, pointing at the importance of being open and of communication between parents and children. Written with a lot of understanding and subtlety and ultimately I think it was me, and not the book that wasn't quite right. It was a powerful read and I can't put my finger on what was wrong for me but it just didn't work for me as much as I'd like it to. However, don't let me to dispirit you, just go and read this book and you'll see for yourself how powerful and emotional it is. I am already looking forward to Ms Berriman's another book. EDIT: A year after my original review and I still think about this book regularly. It has set a benchmark few books reach and to this day remains the best 'insight into the mind of' style books I've ever read. One I still recommend regularly. Disclaimer: Pre-release copy won in competition by Penguin Books. Broken childhood stories are dime-a-dozen these days. Bookshops have entire walls devoted to them. So why should you care about Home by Amanda Berriman? What makes it any EDIT: A year after my original review and I still think about this book regularly. It has set a benchmark few books reach and to this day remains the best 'insight into the mind of' style books I've ever read. One I still recommend regularly. Broken childhood stories are dime-a-dozen these days. Bookshops have entire walls devoted to them. So why should you care about Home by Amanda Berriman? What makes it any different from every entry in the genre? In a word: Jesika. This is not really the story of a broken child, but the story of a curious and caring four year old trying to make sense of what can be a broken world. It has been a long time since I have felt so immersed in a character's world, which is a testament to Amanda Berriman's brilliant portrayal of a naive young child facing some adult situations. The quirky logic of four year olds suddenly makes perfect sense in the context of her thoughts, and as adult readers it is almost painful to be able to make connections and predictions that no child could, or should, make. I work with children, but despite that Home has reminded me what it is truly like to think and feel like a child. How what can seem completely senseless to an adult has logic in the mind of the child. How a quick "not now" can have a far deeper impact than we expect. I first met Jesika, the young narrator of this novel, a few years back - in a short story in the Stories for Homes anthology in aid of Shelter. I am delighted that Jesika had so much more to tell us - though I have to say, this book is not an easy read at times, because of the issues covered which impact upon her life, and the lives of those around her. This is a STUNNING book. Not because it is a debut novel of amazing quality, or because it handles difficult social issues with sensitivity, but I first met Jesika, the young narrator of this novel, a few years back - in a short story in the Stories for Homes anthology in aid of Shelter. I am delighted that Jesika had so much more to tell us - though I have to say, this book is not an easy read at times, because of the issues covered which impact upon her life, and the lives of those around her. As I've just said, 'Home' is told by four-year old girl, Jesika. Yep, that's right - the entire story is written from a four year olds perspective, including the language that a young girl like Jesika may use. Little Jesika doesn't understand why a man is shouting at her mummy, or why her little brother and mummy are constantly coughing and crying. She also doesn't understand why the floor is wet in their bedroom or why the big box in the kitchen stops working and makes the house cold. Whilst Jesika's situation is heartbreaking in itself and her innocence to the entire situation is enough to make the strongest person melt into a puddle, the storyline became even more heartbreaking as it progressed. I don't want to give too much away, but a new girl has appeared at Jesika's playgroup, little Paige, and, whilst Jesika wants to try to take her under her wing as much as a four-year can, there is a lot more to Paige that meets the eye. Way, way more. No, I don't mean that I am actually Paige in this book, I mean that at one point in my life, I was 'a Paige'. I had endured a situation very similar to hers and I just wanted to reach into the book and protect her from it. But I couldn't and, as weird as this sounds, I actually felt as though I was letting her down because I couldn't protect her. Daft eh? Many readers will be able to relate to 'Home' on various different levels. In an ideal world, nobody would be able to relate to the situations covered in the book, but the big wide world isn't perfect. What I loved most about this book was the way in which Amanda Berriman captured my heart from the very beginning by telling her story via Jesika. I have never read a book which was told from a person as young as Jesika before and I thought it was such a clever way of bringing the heartbreak home. I mean, people need to sit up and take notice of children, don't they? I thought the themes were written realistically yet sensitively, keeping the impact of the devastating circumstances as real as possible as though the events were actually unfolding before your eyes. It was hard to read, but then storylines like this shouldn't be easy to read, should they? Amanda Berriman is a phenomenal, phenomenal storyteller who has created a suspenseful, heartbreaking novel in the most beautiful way possible. It was flawless and highly emotional, and probably one of the most outstanding books I think I have ever read. I'm not ashamed to admit that my eyes leaked a bit at the end of the book, nor am I ashamed to admit that my body was exhausted from the emotional rollercoaster I had just read. But, hand on heart, I think that everyone needs to be put under Jesika's spell as she tells the story of her life in the way that she sees it - innocently. A stunning portrayal of heartbreak, innocence, and the power of friendship - 'Home' is the book of all books to make you feel like you truly are, at home. This is the kind of book book I dread, a story so compelling and gripping and yet filled with growing dread, as the truths of the tale begin to make themselves clear. I needed to read on but I really didn’t want to. It made me angry and made me incredibly sad. It so affecting because it is based so firmly in the unfortunate realities of today’s society. Cleverly told from a very young child’s perspective, this book is a brilliantly drawn description of the unseen struggle some families face in po This is the kind of book book I dread, a story so compelling and gripping and yet filled with growing dread, as the truths of the tale begin to make themselves clear. I needed to read on but I really didn’t want to. It made me angry and made me incredibly sad. It so affecting because it is based so firmly in the unfortunate realities of today’s society. Cleverly told from a very young child’s perspective, this book is a brilliantly drawn description of the unseen struggle some families face in poverty; nightmare landlords, horrendous housing conditions. Then there are other horrors, those taboos that we shiver to think of let alone speak of. The misspellings and misheard words really reinforce that everything is being seen and heard from a position of complete innocence, from a different perspective born of a much reduced experience. The adults try to shield her from things and in one case deliberately manipulate what little Jesika sees and believes. It is not all doom and gloom, there are friends amongst those that in the majority that turn a blind eye to the wilful neglect for the welfare of this young family, bureaucrats and jobsworths who create obstacles where there should be none. There are also lovely folk doing their very best to assist the proud young mum as she tries to keep her young family afloat. This story is a cautionary tale, a searing exposé of the situation for far too many poor families in Britain and I highly recommend it for any parent of young children however “squirmy” it makes your tummy. If they were to take away only one message, let it be to keep channels of communication open between child and parent so they feel safe in telling their truths however they need to express them. As the narrator of Home is a young child, it took me a little while to get used to Amanda Berriman's writing style. As well as words being spelled as you say them, Jesika's feelings are described with such heartbreaking simplicity that she instantly found a place in my heart. Amanda Berriman has done a remarkable thing; to be able to view the world through the eyes of a young child and to share that view with the reader so that we feel as if we are actually looking through Jesika's eyes. My heart As the narrator of Home is a young child, it took me a little while to get used to Amanda Berriman's writing style. As well as words being spelled as you say them, Jesika's feelings are described with such heartbreaking simplicity that she instantly found a place in my heart. Amanda Berriman has done a remarkable thing; to be able to view the world through the eyes of a young child and to share that view with the reader so that we feel as if we are actually looking through Jesika's eyes. My heart clenched with both joy and sorrow as I felt every single emotion with Jesika. I cared for the characters so much that I worried for Jesika's mum, Tina, and feared for the health of Jesika's baby brother, Toby. When Jesika goes to nursery and makes friends with Paige, I dreaded reading what I feared was coming next. Paige is a troubled little girl, often silent and moody, who has been told to keep a secret but she eventually lets Jesika into her world. I held my breath as the scenes played out to expose the secret that Paige, or any child, should never have to keep. Home is an emotion filled book with some dark scenes that are written with care and subtlety. Seeing an adult world through a child's eyes is quite an eye-opener and although I envied the simplicity of trust and honesty in Jesika's world, seeing how this trust can be exploited was completely heartbreaking. Home is an absolutely heartbreaking, emotional debut that will invite Jesika into the heart of every single reader. I knew from the first paragraph of Home that I was reading something very special and that it was likely to break my heart. The book is narrated throughout by four-year-old Jesika and through her innocent words that we learn of her mother's desperation as she tries to raise her two young children alone in a flat that is barely fit for purpose. While Jesika believes the black marks on the walls are tadpoles and is confused why her Mummy thinks they're moles, we realise that the reason why her lit I knew from the first paragraph of Home that I was reading something very special and that it was likely to break my heart. The book is narrated throughout by four-year-old Jesika and through her innocent words that we learn of her mother's desperation as she tries to raise her two young children alone in a flat that is barely fit for purpose. While Jesika believes the black marks on the walls are tadpoles and is confused why her Mummy thinks they're moles, we realise that the reason why her little brother, Toby keeps coughing is due to the mould growing inside their flat. Home is poverty laid bare, if it's possible to disregard the stories of adults driven down by their seemingly hopeless situation then the voice of this funny, wise little girl should be harder to ignore. When Jesika tells of her Mummy being cross or tearful, it's clear that this is a woman who believes she has nowhere to go and has reached the point where she feels little but despair. Amanda Berriman's book is an important reminder that the snapshots we see of a person's life so often don't tell the whole story. How often are mothers (particularly) judged for snapping at their children, for shouting at them in public, for not remembering to dress them in the correct clothes for special days at school? Tina is that woman and to the casual observer she may appear waspish and chaotic. In truth she is a loving mother who reads to her children every night and worries about what they eat. Life hasn't been kind to Tina though, left as a single mother she became a victim of the bedroom tax after her mother-in-law died. Home reflects the grinding daily struggles for too many people in 21st century Britain and that it's seen through the eyes of a young child who doesn't yet understand how desperate their situation is, just makes it even more poignant. When Jesika's innocence and sunny disposition is threatened, it's impossible not to think of the real life children who are silenced by some of the adults meant to protect them. Amanda Berriman makes good use of current safeguarding advice as Tina uses the Underwear Rule to remind Jesika about body autonomy. However, for all the excellent intentions behind such advice there are still adults who know how to exploit the naivety of children and parts of Home are very difficult to read. Home is a book that will stay with me for a long time. I work in a primary school and was immediately struck by not only the authenticity of Jesika's voice but also Amanda Berriman's appreciation of the lyricism of a young child's language. This may be a work of fiction but the story is all too real, Jesika's perspective is the actual lived experience of so many children as they notice more than we realise yet still manage to find the magic in the day to day. It's also a book about the strength of those who keep on keeping on even when they are let down by the system time and again. Home should make you angry as it tells profound truths about everyday people. That this a debut novel is extraordinary, Home got under my skin like few books can. Jesika's sweet words expose an often bitter reality but there's also humour and fortitude here. Home is an unforgettable, touching book that shines a light on difficult but only too common subjects, it's not depressing but is a call to demand better for all the Jesikas, Tinas and Tobys out there. An absolute must-read book. All the way through this book I’ve felt conflicted; it was either a brilliant concept or a total gimmick to tell this story from the point of view of a very young child. I thought it would all depend on the ending, but Even after finishing the book I’m still conflicted! There were some very powerful moments in the book, particularly around the ‘revelation’, and I was undeniably gripped throughout the whole thing, I just kept being pulled out of the story a little by the phonetic spelling and the All the way through this book I’ve felt conflicted; it was either a brilliant concept or a total gimmick to tell this story from the point of view of a very young child. I thought it would all depend on the ending, but Even after finishing the book I’m still conflicted! There were some very powerful moments in the book, particularly around the ‘revelation’, and I was undeniably gripped throughout the whole thing, I just kept being pulled out of the story a little by the phonetic spelling and the 4 year old voice. I don’t think that this story could have been told in any other way,however, and for the purpose of the narrative it worked very well. Unfortunately I thought the power the book contained in the first half dropped off at the ending. No spoilers, but I wanted something more dramatic and I felt rather as though it fizzled out.